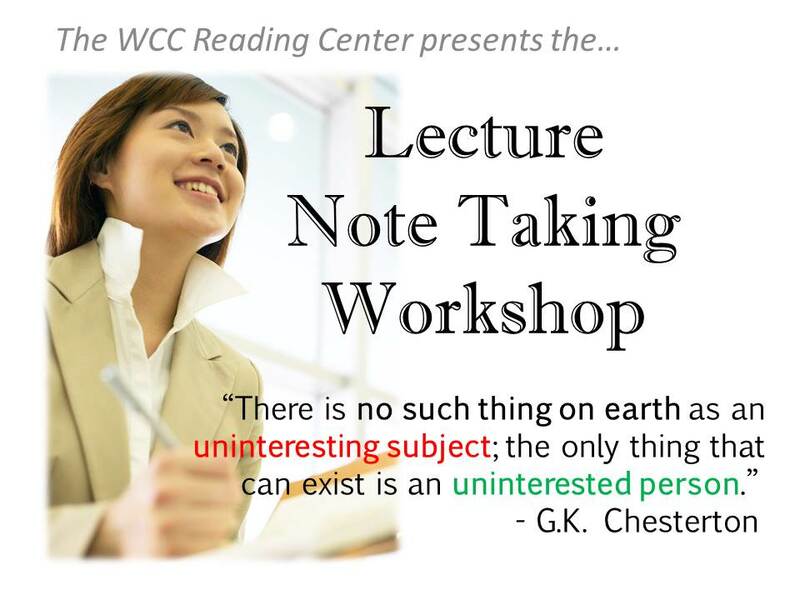 The Lecture Note Taking Workshop | Save My Reading Life! Unfortunately for most of us, not everything we have to listen to at school or at work is interesting. Despite our lack of interest, we must still understand what is being said, why it is important, and what we need to do with that information. The only way you can get good at listening is by practicing good listening skills: “Perfect practice makes perfect,” someone once told me, and it’s very true. By practicing good listening skills all of the time you can become an excellent listener and note taker. Instead of immediately turning off your ears when faced with uninteresting material, find ways to make it interesting–and practice your best listening and note taking every single time you do! 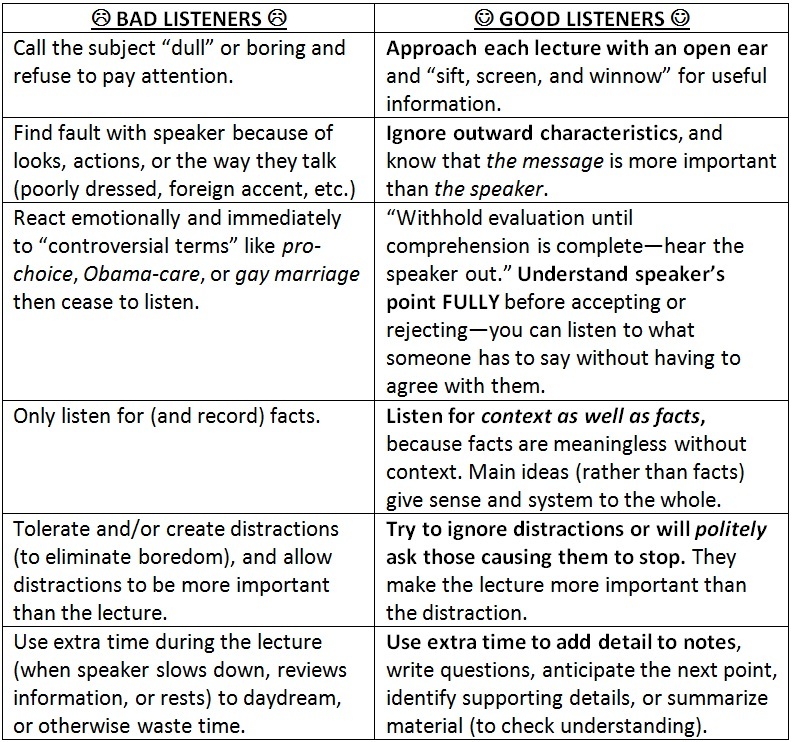 The differences between good and bad listeners. Click the picture to enlarge. Active listening means that the person who is listening is thinking about what is being said. Active listeners pay attention to the message of the speaker, what words are used, how the message is said, and why the message is important. 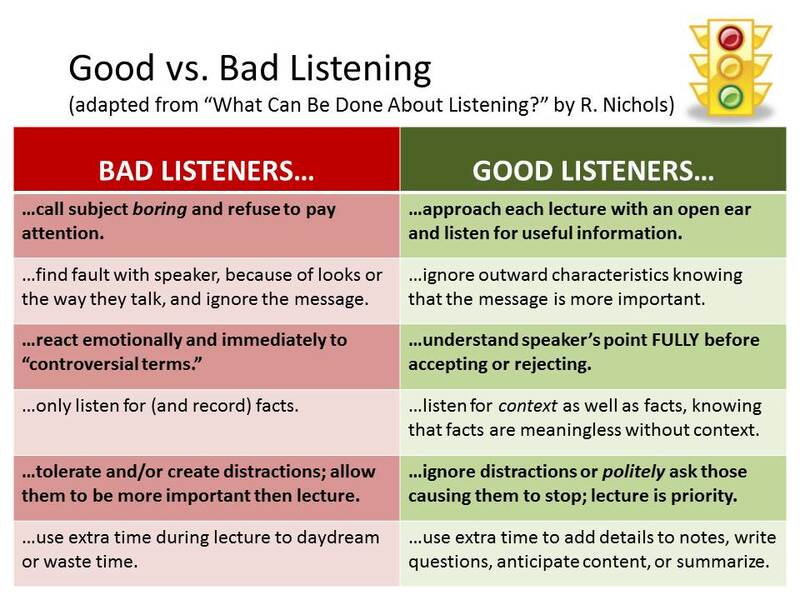 Look at the chart to the left to understand the differences between good listening and bad listening, adapted from the article “What Can Be Done About Listening” by Ralph G. Nichols. To be a good listener, it’s important that you be “in the moment” while you are listening to the speaker. Try your best to stay focused on what is being said and not what is going on in your own mind. One way to do this is to doodle. Doodling vs. Daydreaming: A recent study suggests that doodling keeps the brain the brain actively involved with the task at hand (Andrade, 2009). There is a huge difference between doodling and daydreaming. When you doodle while daydreaming, you are simply entertaining the thoughts of your own mind–like planning your next beach vacation while you doodle pictures of palm trees. This is a wasteful kind of doodling. Daydreaming actually takes a great deal of energy (and concentration) from the brain. So, instead of daydreaming, draw a picture of what is being said. It does not have to be realistic or even “pretty”–abstract drawings of information can be useful to jogging memory later on. Types of doodles could include: charts, Venn diagrams, stick figures, or anything that helps you to represent the information. 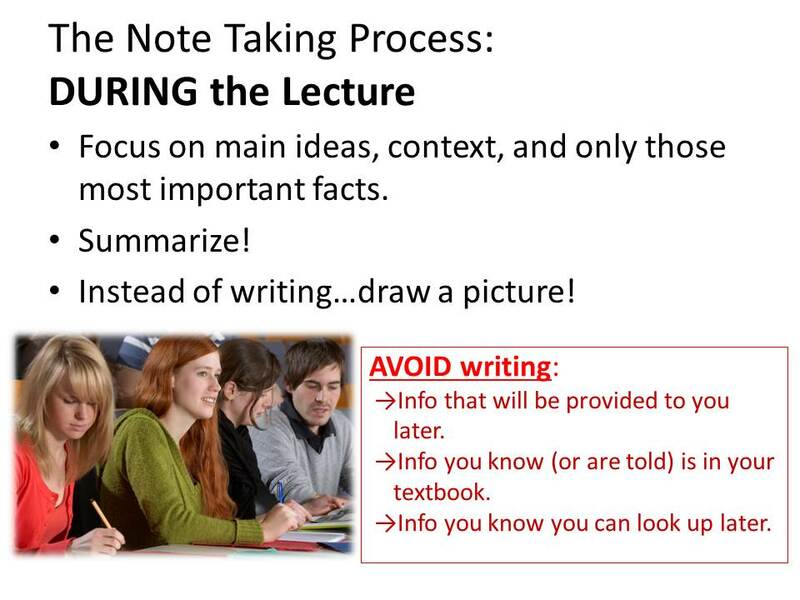 Good note taking begins before you even sit down in the class. Ideally, you want to always be thinking ahead about what material will be covered in upcoming classes so you can predict and build your schema, or prior knowledge, before you attend the lecture. If nothing else, just before the lecture begins, look over your previous class notes, your already-read textbook chapters, or even your class schedule to get an idea of what material had already been covered, and what material you think will be covered. Look over the syllabus/class schedule–what has been discussed in the course so far? What have you already learned? What can you predict will be the topics in the upcoming lecture(s)? What do you already know? Review your notes from your most recent lecture–is the upcoming lecture a continuation of the previous lecture? Or all new material? Or a combination of both? Go over your annotations in your textbooks, essays, and other handouts–what can you expect in the lecture based on your readings? Do you have questions about the reading that would be appropriate to ask in the class? Did you understand the material fully? Or do you expect the teacher will give you more information? Before you begin, make sure to prepare your note page(s). Draw lines to split your pages (if doing something like Cornell Notes), write page numbers and/or the date at the top, and add any other useful information (like what chapter is being covered). During the lecture you do not have time to write every word that the speaker is saying, so do not even try. The average lecturer speaks at 125-140 words per minute; the average note taker writes at about 25 per minute: you should not be taking word-for-word transcriptions of what the speaker says–it’s impossible! Focus on main ideas, themes, context, and only those most important facts. Do not just copy facts down from the board; write why those facts are important. Summarizing is your friend! Listen closely, without writing, until the speaker gets to the end of a thought, the end of an idea, or finishes explaining an example. Then take a moment to summarize briefly using a bulleted word list, a short phrases, or incomplete but coherent sentences. The more concise (or short) they are the better your summaries will be. If possible, instead of writing to explain relationships between ideas, draw a picture. Idea maps, grids, flow charts, graphs, comic strips, stick figure representations, and other graphics can go a long way to help you remember lecture information. PowerPoint slides that your instructor posts online for you to download or hands out before lecture. You are only creating more work for yourself and, instead, you should focus your efforts in recording why the information on the slide is important; not what is on the slide. Information that you know is in your text, especially if your instructor tells you that it is in your text. There is a temptation to copy facts from lecture. If your instructor tells you that a fact, list, or idea is in your text, or another source from the class, then instead of copying that information down, write why the instructor is mentioning it. Information you know you can find later. Sometimes your instructor will give you information from other sources and they may even tell you where to find those sources or post them online for you to look at later. You do not need to write that information down. Instead, write why the instructor mentioned it, and any significant information you need to remember to find that source later, like the URL, the name of the author, when it was published, etc. 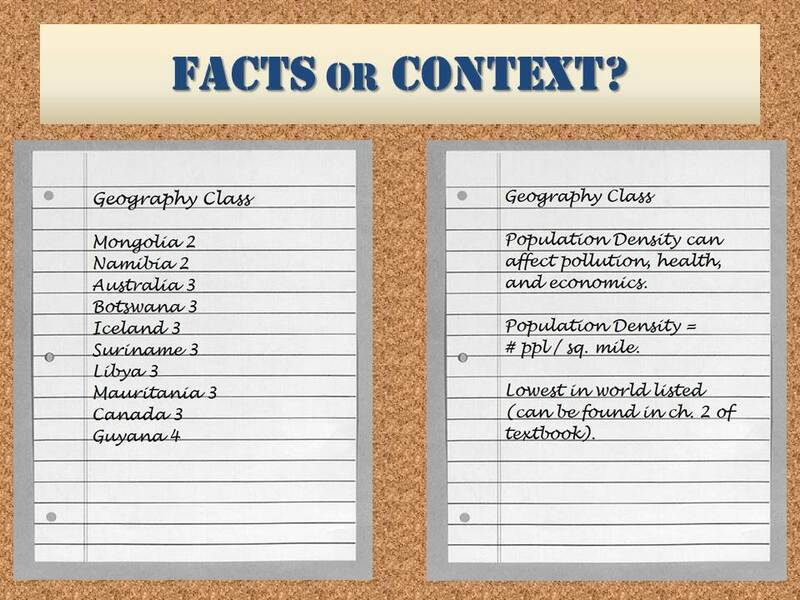 Slide 5: Facts or Context? To understand the difference between “facts” and “context,” take a look at the slide above (click on the image for a clearer, larger picture). These two note pages are two different strategies to take notes from the same geography lecture. Look carefully at the one on the left, then at the one on the right. The student on the left wrote a list of 10 countries with numbers next to the name of each country. This student wrote down exactly what was on the PowerPoint slide that his instructor provided. He did not write why the list was important and, while he was busy copying down each country and number, his teacher was explaining why that list was important and how it was significant to geography. When he looks back at this page of notes later, the student will have no idea why this list is important or why he bothered to write it down at all. The student on the right wrote the explanation the teacher gave about why that list on the PowerPoint was important. This student examined the list on the slide quickly, then listened carefully to what her teacher had to say about the list and summarized what her teacher said. This student wrote down the context of the list or why the list is important. Even though this student did not write down the list, she wrote down where she could find it in her textbook to go back and find that list again if necessary. After examining these two note pages, which note page would you like to see in your own note book? I know I would rather have the page on the right. First, there is no one “right” way to take notes that works universally in every class and for every student. A method that works in one class might not work at all in another class. You may have a great note taking strategy right now but find yourself in a class later in which your strategy no longer works. 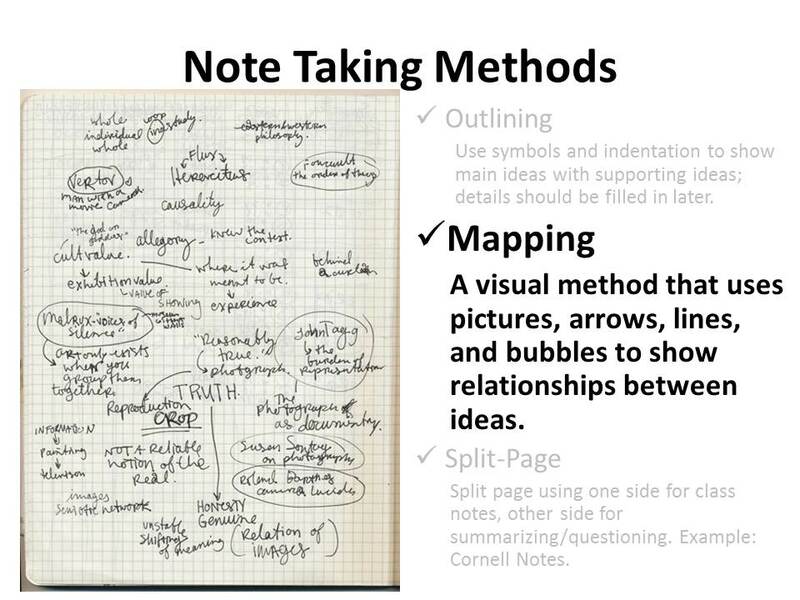 This is why it is important to be familiar with different methods of note taking, so you can change them or switch them around as you need them. Second, note taking is based on your personal preferences and should cater to your individualized needs as a learner. While your notes might work great for you to study from, someone else might find them to be nonsense. That is not necessarily a bad thing. 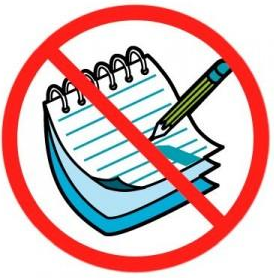 Do not think that your notes have to work for everyone who takes the class: your notes must only work for you. While it is best to avoid messy, unclear, or vague notes, these things are only a problem if you cannot make sense of them later when you come back to review. Method 1: outlining. 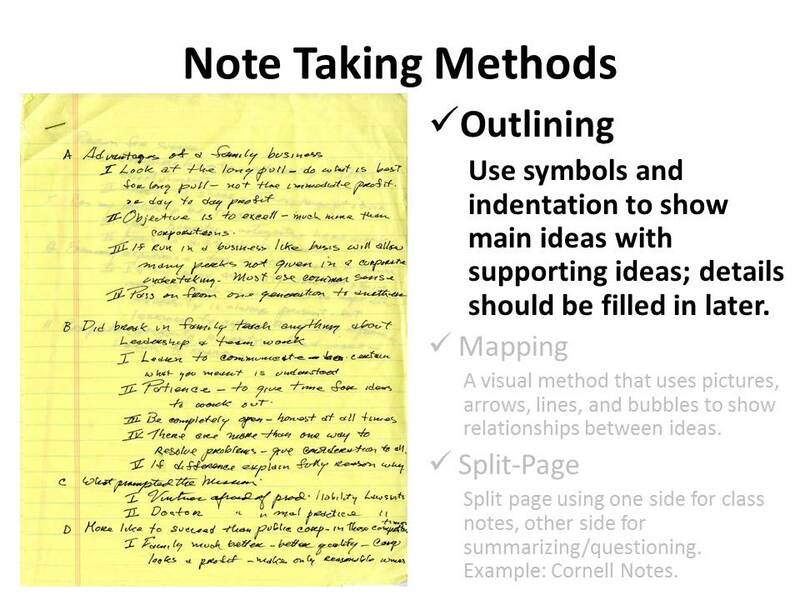 Outlining is organizing the information from the lecture in an outline-style format, indenting to show main ideas with supporting details/examples. Details and facts are usually filled in later on, after lecture. Example of Outline-style Notes. Note that the notes done in-class are in black ink and the “review” information (done later) is in red ink. Pros: This note taking style is easy to review, and is often the easiest style to share with other students if you are taking notes for others. Main ideas are easy to identify and “leaving room” on the page by skipping lines so you can add details later. Cons: This method requires the listener to be aware to the speaker’s organizational pattern and can be hard to do if the speaker jumps around from topic to topic. If not reviewed and filled in with detail, the main ideas can lack the information necessary to make the notes meaningful. Method 2: mapping. Mapping is a visual note taking method that focuses on picture, arrows, lines, and bubbles to show relationships between ideas; it is a visual form of outlining. Details are usually filled in after lecture. Mapping is more effective if done with a “personal” touch–using your own creativity and understanding to create a picture of the material being presented. An example of a map-style note page. 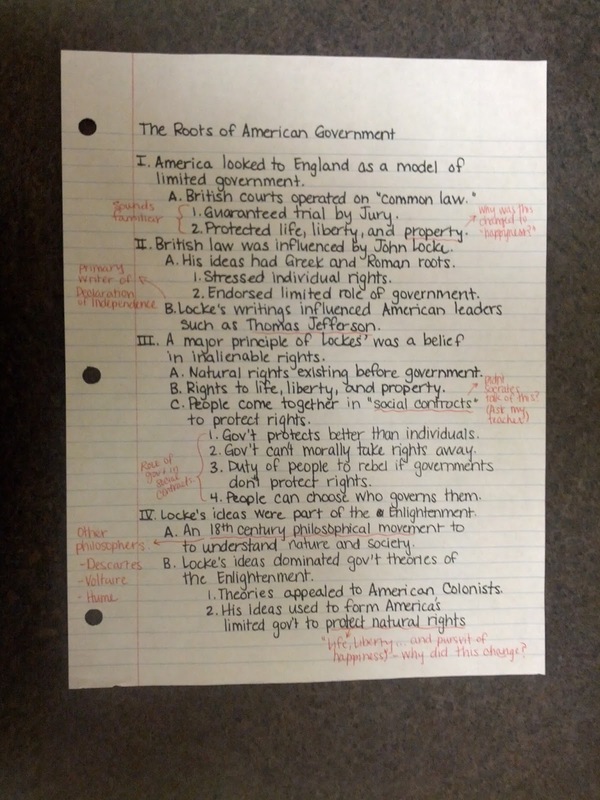 Note, again, the use of black ink for in-class notes, and red ink for “review” notes. Pros: Mapping helps to make seeing the main ideas and relationships much clearer and often drawing pictures helps students to relate to the material more, thus making it easier to remember. Cons: Mapping is very hard to do if you do not thoroughly understand the material and can slow down note taking. Some people (i.e. teachers) may think you are just “doodling” or not paying attention. 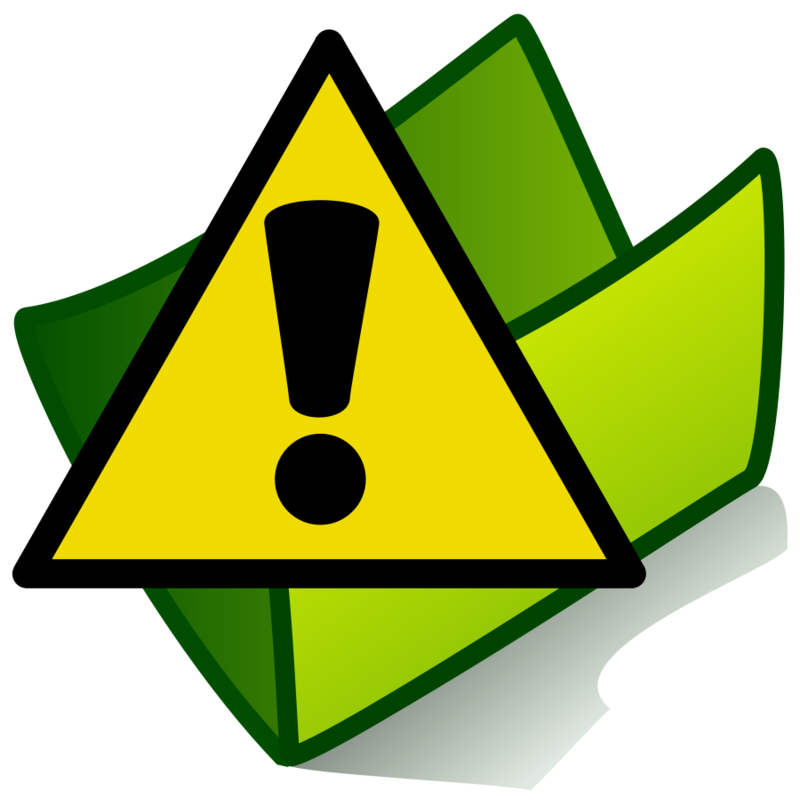 Mapping may not make sense to others, so mapping is generally not recommended for shared notes in most cases. 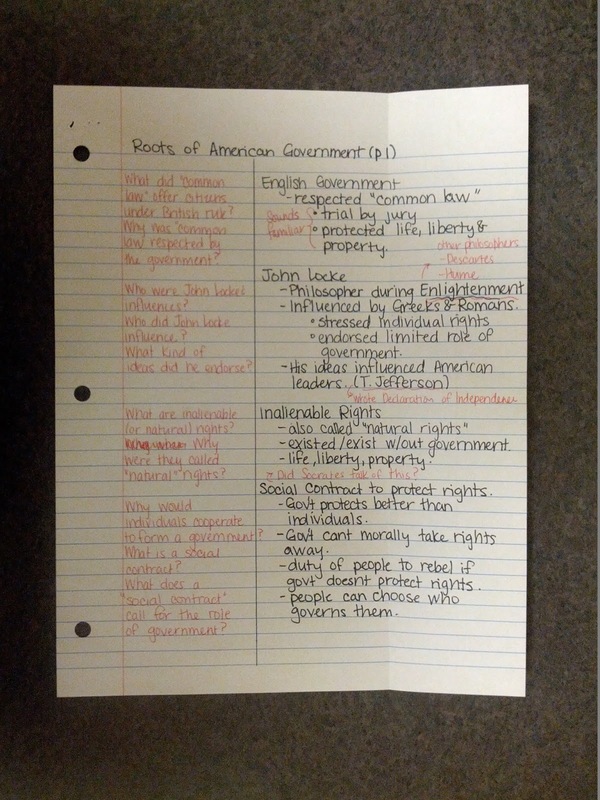 Split page note taking is a method that involves splitting the page in half, or two-thirds vertically, leaving one side for in class notes and another side for reviewing strategies. 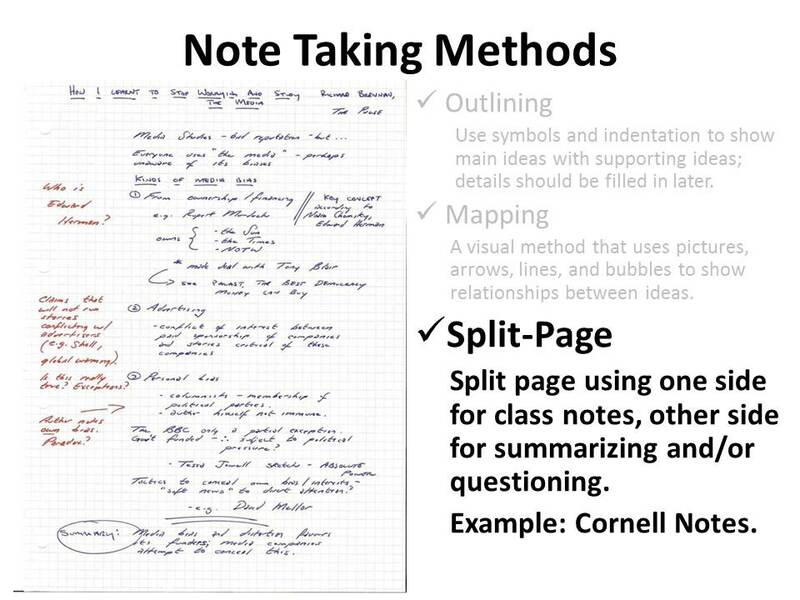 The most well-known split page method is called Cornell Notes, developed by a science teacher at Cornell University. 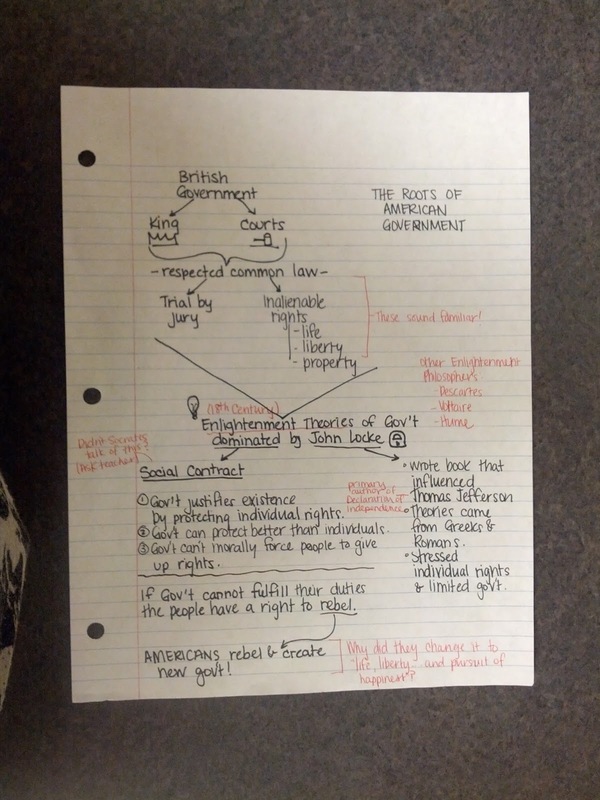 Cornell Notes are not the only method of split page note taking. Example of split page notes. The basic way to do split page notes is to divide your page in half or two-thirds down the page, vertically. 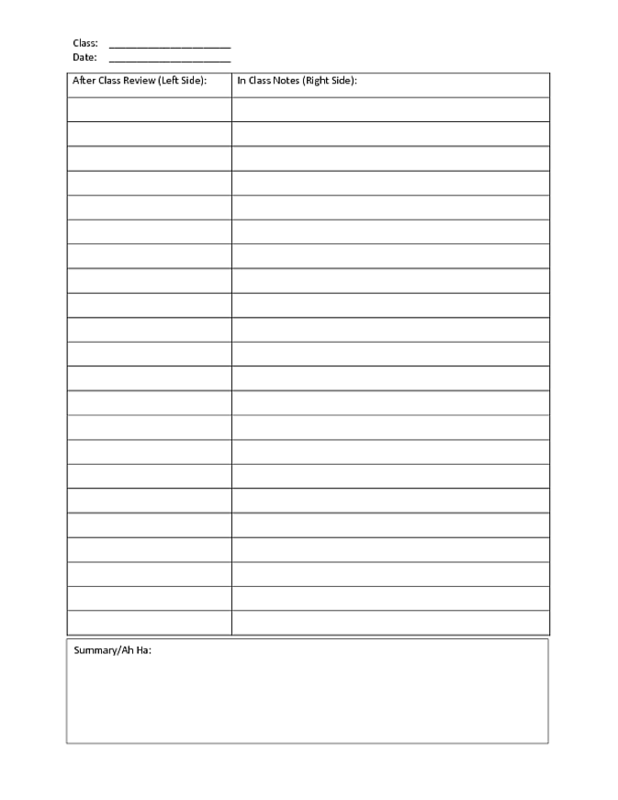 To the right is an example sheet you can view, or this is a .pdf of Split Page Notes you can download and print to use for your note page. While you are in class, take notes on whatever side you want; on the example provided, write on the right-hand side of the page. You can write short, concise phrases or bulleted lists; use outlines, maps, or draw pictures. 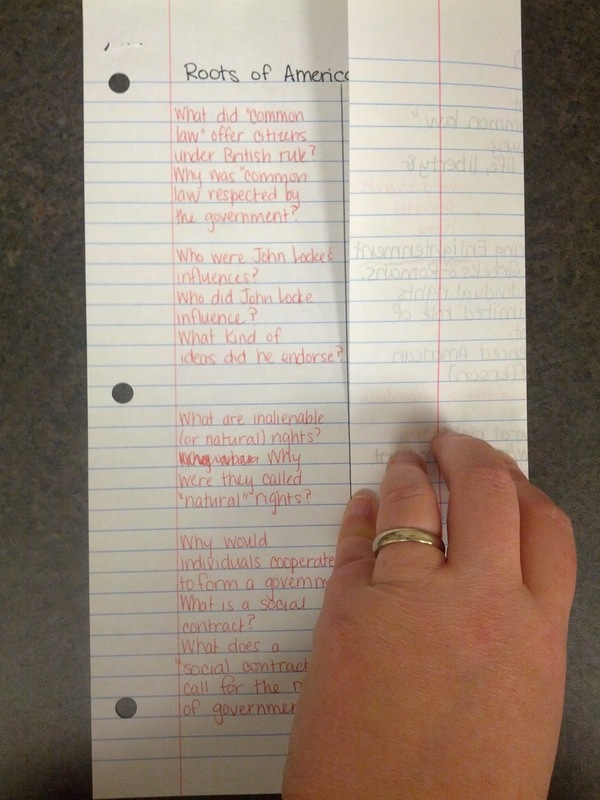 The other side of the page is your review column (Cornell Notes call it the “Cue Column”). After class, return to your note page and pull out questions, paraphrase definitions, add information from the book that complements the lecture, or create your own examples based on your lecture notes. Any or all of these things can be done in your review column; use your best judgment based on your instructor, the class, your expectation/experience of the exams, and what your purpose is. Your notes may change and vary from class to class so do not be afraid to experiment with what you write to try new strategies. Split page notes: black ink for in-class notes and red for the “review.” Fold the page over (in the next picture) to quiz yourself on the material. Fold the page over to quiz yourself on the material. Pros: The split page method can incorporate any of the other methods within it: you can take outline or mapping notes during lecture. This method is easy to review with lots of space to add information as you go and after lecture. It’s also a nice method to share with others because the review section allows for clarification and additions that make it easier for someone else to understand. Cons: Forgetting to review is a huge con! If you do this method make sure you go back to review. If you do forget, set an alarm or add a note to your calendar to remind you. It can also be a hassle if you forget to set up your note page ahead of time. Spend a few minutes before lecture drawing the lines you need so you do not have to fold/draw lines during lecture. This method can also be awkward at first, especially for students who like to “use all the paper.” Be patient and keep trying! After one day, an average of 46% of material is forgotten from lecture on new material; after seven days 65% is forgotten (Spitzer, 1939, p. 648). “Studies have shown that within two weeks you will probably forget 80% (or more) of what you heard…in four weeks you are lucky if 5% remains” (Langan, 2012). Look at the calendar below the quotes (on the slide above) for a visual representation of forgetting material. 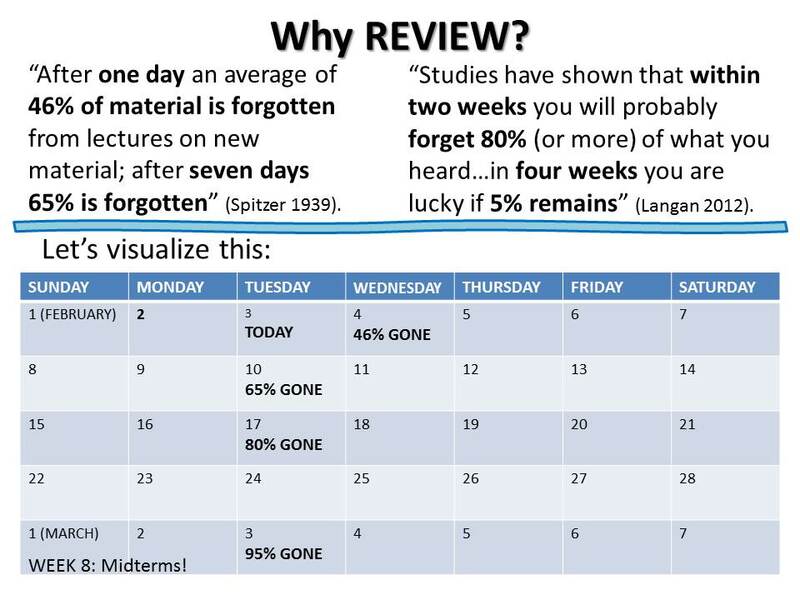 In only four short weeks you can forget most of what you have “learned.” If you do not want to forget, however, the way you can help your memory is to review. Before we go on, I want to emphasize a very important distinction: Reviewing is NOT rereading. Reviewing is not rereading. Reviewing is not rereading. Reviewing is not rereading. Write that down somewhere and remember it because, for many students, the word review is believed to mean the same as reread. These two things are vastly different. Rereading means you go back to the first word on the first page of your book and read everything again; if it took you 3 hours the first time to read a chapter, it will take you another 3 hours to reread it. Rereading can be valuable, especially if you are confused, but it is not the only strategy to help memory and, in fact, rereading entire chapters or books simply to improve memory can do more harm than good. Reviewing, on the other hand, means you go back over the material to keep it fresh in your mind. If it took you 3 hours to read a chapter, it might only take you 15-30 minutes to review it, depending on how thoroughly you review it. You can review on the bus on the way to class, in the few minutes before class starts, or while you wait for an appointment. While you review you may decide to reread certain sections or paragraphs to help you remember more complicated or hard parts of the chapter, however the goal of reviewing is to keep material fresh in your mind, not to reread. Review material more often when you have first learned it, and less often over time. For example, you can review your lecture notes you took in class on Monday every single day (Monday through Sunday) for 5 minutes each day. After one week, you then review those same notes 3 times a week for two weeks; after that, once a week until you begin studying for your final. By the time you get to your final exam, you will be reviewing your entire notebook for maybe 30 minutes a week, but you will be more likely to remember information, no matter how long ago you learned it. The first 24 hours after you take your lecture notes is the most critical to remembering that information long-term. While it is important to review information over time, the first time you review it is critical because the information is fresh; you are more likely to remember what your teacher said, the thoughts you had, your questions and concerns and you can record those questions, thoughts and ideas in your notes to help you remember. fix any spelling errors. Even if your teacher does not care about spelling, fixing your spelling errors will help you connect the things you heard (the teachers lecture) to things you read (your textbook). It is not unusual for a student to hear a word but not know how to spell it so they record it in their notes incorrectly spelled and, when they refer to their text later, they may not make the connection between the “heard” word and the “seen” word and believe them to be two different words! This disconnect between hearing/seeing can make it very hard to make connections between the class and the text. add any missing information. There are many reasons a student might not record information in lecture: maybe the teacher was speaking too fast, maybe the information did not seem “important” at the time, or it’s information the student thinks can be easily remembered. Take time after the lecture to think about what was said and write anything down in your notes that you may need later. If you wait too long, you will be more likely to forget. add any book information. If you have determined the purpose of your textbook in your class, then you should have some idea of how and why your teacher uses and expects you to use your textbook. You may take examples out of your book, paraphrase them, and add them to your notes to help you understand a theory your instructor lectured on. You may recreate a portion of a graph or chart from your book to provide schema (background knowledge) to the lecture. You might paraphrase the book’s definition next to your instructor’s definition to get a better, more clear, definition of a word. Use your textbook to help complement and supplement your lecture notes. paraphrase information to check your understanding. Paraphrasing is often described as “putting it in your own words.” Another way to think of paraphrasing is to think about how you would explain an idea to another person, like a younger sibling or grandparent, then write down that explanation. The point of paraphrasing is to make sure you understand every part of an idea and, in fact, you know it so well that you can explain it in a very simple way. ask questions. Asking questions is very important to the note taking process and there are two types of questions you should be asking. Questions you have about the material because you do not understand. You need to write these questions down because you want to make sure you ask them the next time you go to class. If you do not write them down, you will most likely forget them and, when your teacher begins class by asking “Does anyone have any questions about the lecture from our last class?” you can refer back to your notes and ask (and probably impress your teacher). Questions that could potentially show up on an exam. Make a point to write down any questions that your teacher posed to the class but also any questions you create yourself. You can turn headings from your outline notes into questions, or brainstorm questions from what you learned. Write these questions down so you can refer back to them later and/or use them as a study guide (if your teacher does not provide one). Connect to yourself. The best way to learn something new, and remember it long-term, is through experience. Look for examples in your past/current experiences. Write any insights you have in your notes as examples and you’ll be more likely to remember them. This strategy can work for just about any class. For example: in Economics, you might experience supply/demand when the price of locally-grown fruit goes up in the winter months. Another example would be to think about your own body when studying anatomy, or your own mind when studying psychology. Though you may not have experienced exactly what you learn in these classes, you can imagine your own experience if you did, or even reflect on similar experiences. Connect to the world. If you see something on the news, in a magazine, or online that relates to information in your classes, make a note of it. You can cut out the article and staple it to your notes, or you can briefly paraphrase or summarize the article. In this way you are connecting what you learn to the world around you and making the information more real. This can be done with most classes you take: in an American History class you can look for historical events in your area that are related to events you are learning about; in psychology, you might find articles about depression or Alzheimer’s disease that help you understand these disorders. See notes on Abraham Lincoln on page 8 of notes (covered in chapter 3). With these notes referring you to other areas of your notebook, you will be encouraged to go back and review previous material and keep even the oldest material you have learned fresh in your mind. 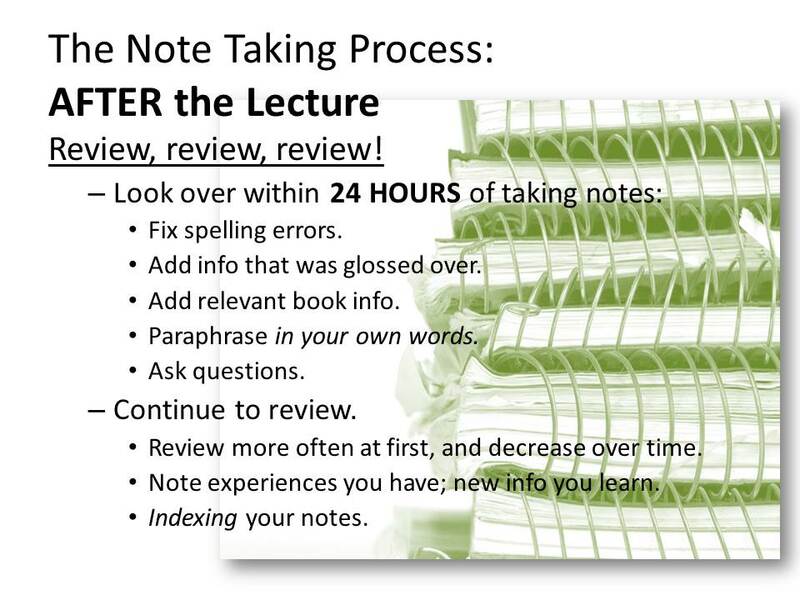 Note taking is a process of preparing, listening, writing, reflecting, and reviewing. The style, or method, of notes you use depends on you as a learner, your class, and the material. Your style can change from day to day, class to class, and semester to semester. If your style does not work, do not hesitate to try other styles. Avoid rewriting your notes and, instead of rewriting, add reflections, experiences, or information from other sources (like your textbook) to help you make sense of the material. Pingback: “10 minutes a day makes an A!”: A Story of Review | Save My Reading Life! 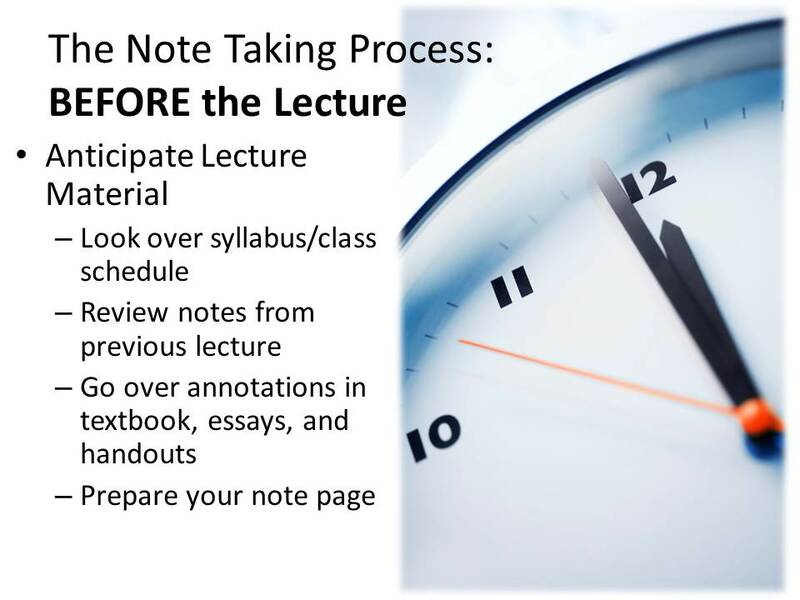 Pingback: Tips, Hints, & Strategies: Steps to Effective Note Taking | Save My Reading Life!